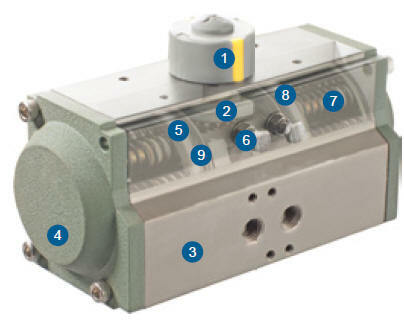 A position indicator with Namur mounting is standard on all HAITIMA pneumatic actuators for mounting acessories. The hardened alloy steel pinion is precision ground and Nickel plated (over 25um) in order to reduce friction, provide maximum wear resistance. Full conformance with the newest standards of ISO5211 & DIN3337. The dimensions can be customized and as options, stainless steel and aluminium are also available. The aluminum extrusion is hard anodized (over 30um) to protect against wear and corrosion while reducing piston friction to the absolute minimum. Other options such as Nickel plating, PTFE and powder polyester painting are available. Epoxy coated (over 150um) die cast aluminum end caps provide maximum resistance against potentially corrosive elements. Other treatments such as Nickel plating & PTFE painting are available. The standard adjustment is + 5° in both the open and closed positions through easily accessible external adjustment bolts. The high tensile steel springs are coated with zinc phosphate for corrosion resistance and longer service. The pre-loaded springs can be safely & rapidly disassembled. The highly durable compound material provides high trust stability with minimum friction and long life. available for high or low temperature applications.